Read a little more about Craig and his show stopping musicals! With his smash-hit shows performed by thousands of youngsters worldwide, Craig Hawes has become one of the leading composers of musicals for children. Craig Hawes was born at a young age in a small Buckinghamshire village. Small but remarkable, for with rebel rocker Ozzy Osbourne and cardinganed crooner Val Doonican as noisy neighbours, and awe-inspiring authors Roald Dahl and Enid Blyton busily creating children’s classics just round the corner, something strange was obviously in the water. Craig was surely destined to be a writer, musician or international bodybuilder. And so it came to pass. Not the bodybuilder part, of course - that was just added for mystery and suspense. Craig duly developed a passion for music and writing. Not serious writing, you understand. Silly writing, and the sillier the better. Comical stories, humorous poems and funny songs designed to tickle his teachers and make his classmates chuckle. As a slightly spotty teenager, his writing won a BBC story competition and a national song-writing competition, he reached the finals of a Rock Band competition and at 16 he wrote and directed his first musical! Craig then packed his pen, paper and piano (it was a large suitcase) and headed to the bright lights of London where he was trained in the mysterious dark arts of music, followed by the even darker arts of... teaching! His crazy career has seen him delve into professional theatre, television, radio and feature film, as well as 15 years as a primary music specialist. It was his time teaching ten year-olds that led to an earth-shattering, scientific discovery - children loved to laugh! They loved to perform, sing, dance, act, but most importantly to laugh! He realised his mission, should he choose to accept it, was to write fun-packed musicals that let children do all those things. And so it came to pass… again. His first children’s musical off the press was published in 1998 by Musicline Publications, who have published each and every Craig Hawes musical ever since. A few years later, Craig packed away his chalk and teacher gown to focus on his writing, creating a string of musicals that have delighted children, teachers and parents worldwide. From “Pirates Of The Curry Bean” to “Robin And The Sherwood Hoodies”, many have gone on to become international best sellers, performed by hundreds of thousands of children in over 30 countries across the globe and beyond. Well, probably not beyond. But you get the idea. 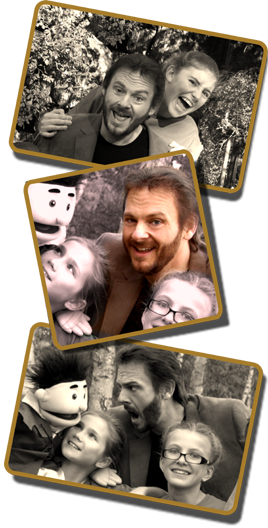 Craig lives and writes in the heart of Sherwood Forest, and when he’s not scribbling or tickling his ivories, he runs his own children’s theatre company along with his wife, the award-winning children’s director and choreographer Hayla Hawes. Together they have been stuffing children into tights and shoving them on the stage for over 20 years. That’s a lot of children. And a lot of tights.